I help clients succeed through creative digital strategy and ongoing education. Build custom furniture or travel the world as a photographer. That I’m here to regurgitate what Google Analytics tells us. The most important or valuable aspect of what I can bring to the conversation is the insight from the analytics and all other digital channels to help create actionable strategies that produce real results. I have a positive outlook on life. I try to spread kindness and happiness to everyone I meet. A spur of the moment trip out of town with my wife and a camera. I’ve always loved the outdoors and I’ve developed a knack for landscape photography recently. I also consider mountains to be a symbol of determination and perseverance. Nobody made it to the top just sitting there. we weren’t sure what was more electric—his hair or his outlook on life! 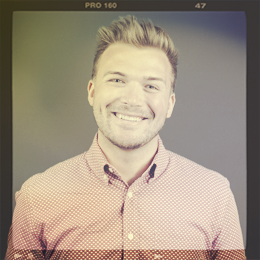 Dylan got his start in marketing as a graphic designer and later helped start an agency in Chicago before deciding his heart (and brain) were destined for a life happily spent with his wife in Indianapolis. Through business ownership, Dylan found a new passion for client service and success, which led him to us (and we couldn’t be happier!). His friendly smile and willingness to tackle new challenges have made him a welcome addition to our digital services team. When he’s not developing and executing digital strategy on behalf of our clients, you’re likely to find him in his garage building something useful and unique for his new home.